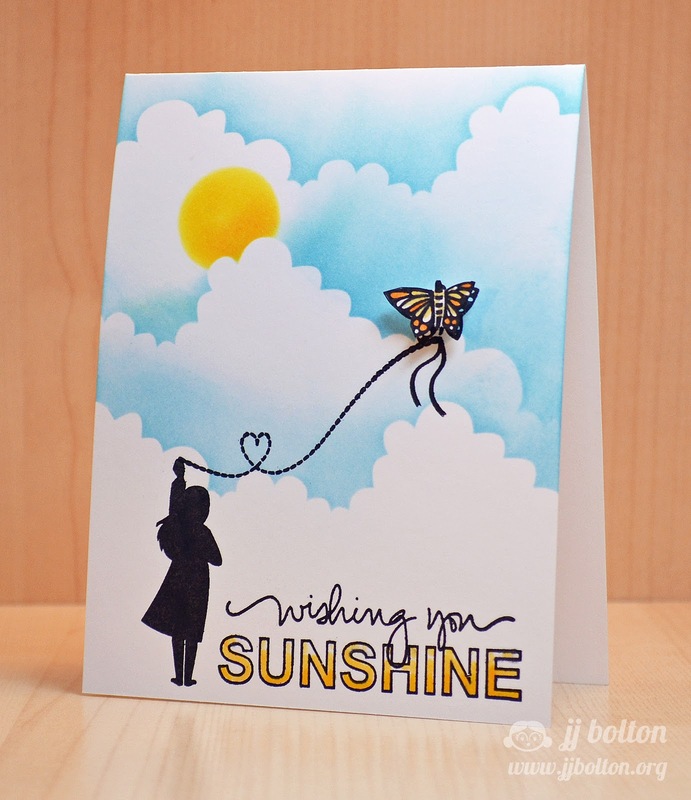 I love the airy-ness in this card and the cloud effect is one of my absolute favorites to do (as seen in this card and this card)! So for my CASE card, the clouds were the element I wanted to carry over. 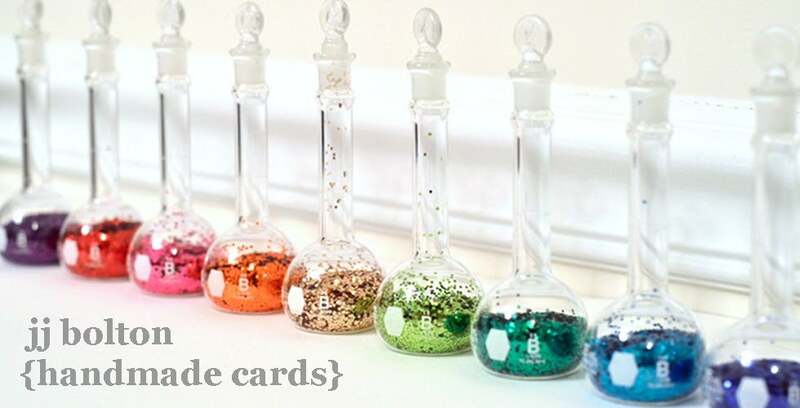 This time I did one of my favorite things to do, an interactive card! 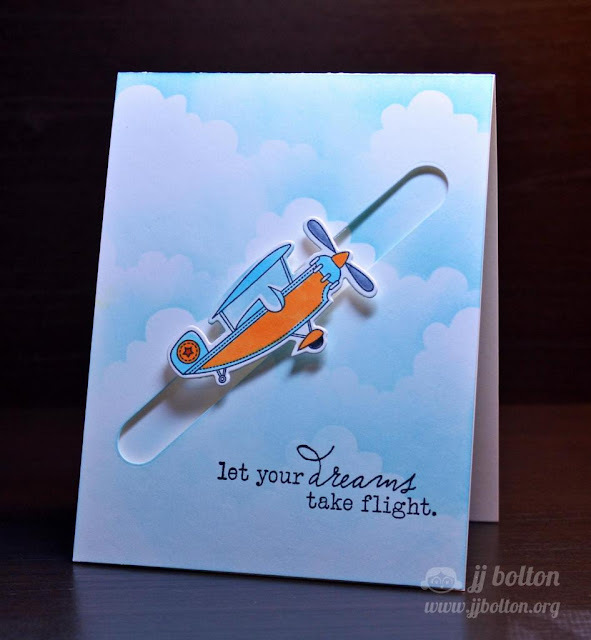 I did a spinner card with a cute little plane stamp/die combo that I had from PTI. One of my pet peeves with spinner cards is the card base not match the top layer. My card OCD kicks in when it doesn't match (crazy, I know). So for my card, I made sure that the base layer (the card base) had matching clouds for a seamless look. To make the clouds, I used my trusty cloud template (that I purchased here) with some Distress Inks. This is sooooo easy to do, and the look is so much fun! Thanks so much for stopping in today! A HUGE THANKS to Chupa and the gals over at CASE Study!!! It goes without saying that the talent pool over there is deep, but more importantly they are such a wonderfully kind bunch of ladies. Thank you so much for the honor! It's been an amazing month! Cute card, JJ. I love how your OCD lined up the clouds on the card base. Perfection to a T.
It does look so finished when the clouds line up! What a fun card JJ! Totally agree with you about the base and the top layer matching - you outdid yourself again you clever girl - I will ponder how you got those clouds to line up for quite a wile - looks amazing and so fun! I really enjoyed casing you and I learned so much this month - hats off you you my dear and thanks so much!! Love the beautiful cloud background. Fab design! This card is very cool! I've done some spinner cards before and never thought about matching up the base - I love how it looks! fabulous JJ! Love that you did this at a diagonal! I love this cloud template too...I've had it for years...thanks for sharing to make the clouds match up on the base! Awesome creating! This card still makes me gasp every time I see it. Wonderful work, as always! i agree with the previous commenters, this card is fantastic, true perfection and love your attention to detail with the matching layers! Totally agree with the sliders needing to match the card. I got those dies, but think I never use them because I have that huge white space in my mind whenever I look at them. Thanks for the reminder just to make them match, an easy fix! They couldn't have picked a more talented gal to CASE! Matching the layers is exactly the kind of AR/OC detail that makes your cards so freaking awesome :) Love both of these - and those clouds. On the wish list! Both of your cards are amazing, JJ! I love the soft clouds and the interactive airplane in the second one...so fun! I love the depth of the clouds in your original card, It looks so awesome ! Love your cased card as well, really impressive how you matched base with the front panel! I love that you have card OCD - I would be the same!! Really adore those clouds and that you did them in a softer hue on your CASE, and the spinner plane ups the fun for sure!! Loved seeing your amazing creations on CASE Study this month, and you really 'brought it' with your contributions too! !